Episode #299 Part II: Superman Family Comic Book Cover Dated April 1960: Superman's Pal Jimmy Olsen #44! Superman's Pal Jimmy Olsen 44! Download Episode #299 Part II! NOTE: This is the 350th individual episode of THE SUPERMAN FAN PODCAST. Thank you for following me through the time barrier to explore the silver age adventures of Superman! SUPERMAN'S PAL JIMMY OLSEN 44, April 1960, was published around February 18, 1960. It contained 32 pages for the cover price of a dime. 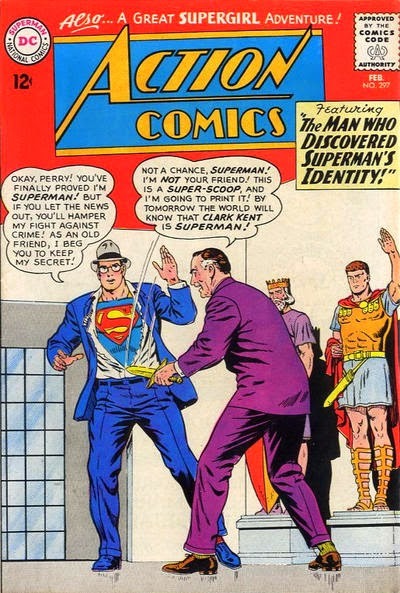 Mort Weisinger was the editor, and the cover was pencilled by Curt Swan and inked by Stan Kaye, featuring the first of the issue's three stories on the cover. All three stories in this issue have been reprinted in SHOWCASE PRESENTS: SUPERMAN FAMILY vol. III. - THE WOLF-MAN OF METROPOLIS (9 pgs. ), was written by Otto Binder, pencilled by Curt Swan and inked by Stan Kaye. 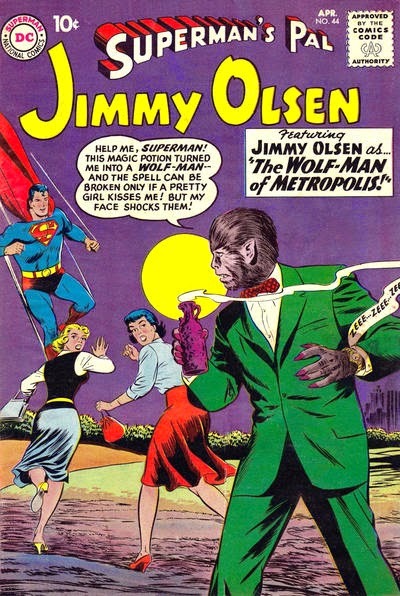 This story has also been reprinted in SUPERMAN: THE STRANGE TRANSFORMATIONS OF JIMMY OLSEN. - JIMMY'S LEPRECHAUN PAL (8 pgs. ), was written by Jerry Siegel, pencilled by Curt Swan and inked by John Forte. This was Siegel's 82nd silver age Superman story, and his 126th overall for the era. Previously he wrote SUPERBOY MEETS SUPERGIRL for SUPERBOY 80, April 1960, pencilled by Curt Swan and inked by John Forte. This story was reprinted in SHOWCASE PRESENTS: SUPERGIRL vol. I and SUPERBOY: THE GREATEST TEAM-UP STORIES EVER TOLD. - MISS JIMMY OLSEN (9 pgs. ), written by Robert Bernstein, pencilled by Curt Swan and inked by Stan Kaye, was also reprinted in SUPERMAN: DAILY PLANET. Also highlighted in this episode were the issue's ads and other features, including the JIMMY OLSEN'S PEN PALS letter column. Next Episode: SUPERMAN COMIC BOOK COVER DATED MARCH 1963: ACTION COMICS 298! In 2 Weeks: SUPERMAN FAMILY COMIC BOOK COVER DATED MAY 1960 PART I: WORLD'S FINEST COMICS 109! In 3 Weeks: SUPERMAN FAMILY COMIC BOOK COVER DATED MAY 1960 PART II: SUPERMAN'S GIRL FRIEND LOIS LANE 17! In 1 Month: SUPERMAN COMIC BOOK COVER DATED APRIL 1963 PART I: SUPERMAN 160! In 5 Weeks: SUPERMAN COMIC BOOK COVER DATED APRIL 1963 PART II: ACTION COMICS 299! If you're going to be in London, England between June 10 and July 12, 2014, you might be interested in the play, THE CORRUPTION OF DORIAN GREY at The Lion And The Unicorn Theatre. Click here for ticket information. Episode #299 Part I: Superman Family Comic Book Cover Dated April 1960: Superman's Girl Friend Lois Lane #16! Superman's Girl Friend Lois Lane 16! Download Eoislde 299 Part I! 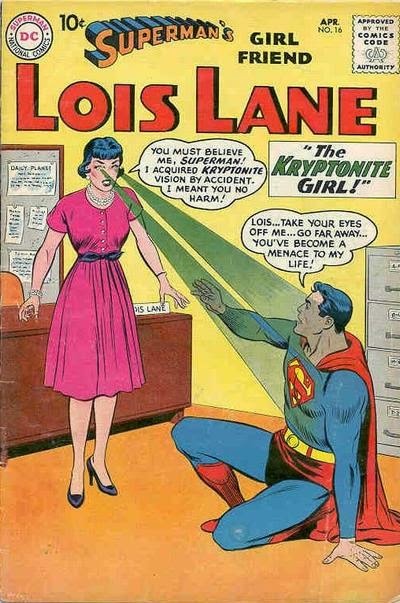 SUPERMAN'S GIRL FRIEND LOIS LANE 16, April 1960, was published on February 9, 1960. It contained 32 pages for the cover price of 10¢. Mort Weisinger was the editor, and the cover was pencilled by Curt Swan and inked by Stan Kaye, featuring this issue's third and final story. All three nine page stories were drawn by classic Lois Lane artist Kurt Schaffenberger, and have been reprinted in SHOWCASE PRESENTS: SUPERMAN FAMILY vol. III. - LOIS LANE'S SIGNAL WATCH, writer unknown, according to Mike's Amazing World Of DC Comics and Comic Book Database, while the Grand Comic Book Database lists the author as possibly Jerry Siegel. Since there is some disagreement on the writer credit for this story, I won't add it to Jerry Siegel's total for his silver age career. - THE MYSTERY OF SKULL ISLAND, again, writer unknown according to Mike's Amazing World Of DC Comics and the Comic Book Database.com, while the Grand Comic Book Database credits Robert Bernstein as the author. - THE KRYPTONITE GIRL, according to Mike's Amazing World Of DC Comics and Comic Book Database.com, the writer is unknown, while the Grand Comic Book Database lists Jerry Siegel as the writer. Since there is some disagreement about the author of this story, I'll also not add this credit to Jerry Siegel's silver age comic book career. Next Episode: SUPERMAN FAMILY COMIC BOOK COVER DATED APRIL 1960 PART II: SUPERMAN'S PAL JIMMY OLSEN 44! In 2 Weeks: SUPERMAN COMIC BOOK COVER DATED MARCH 1963: ACTION COMICS 298! In 3 Weeks: SUPERMAN FAMILY COMIC BOOK COVER DATED MAY 1960 PART I: WORLD'S FINEST COMICS 109! In 1 Month: SUPERMAN FAMILY COMIC BOOK COVER DATED MAY 1960 PART II: SUPERMAN'S GIRL FRIEND LOIS LANE 17! Episode #298 Part II: Superman Comic Book Cover Dated February 1963: Action Comics #297! Download Episode 297 Part II! ACTION COMICS 297, February 1963, was published on December 27, 1962. It contained 32 pages for the cover price of 12¢, and, according to the Statement Of Ownership printed inside, had a total circulation of 435,000 copies. Mort Weisinger was the editor, and the cover was pencilled by Curt Swan and inked by George Klein, the same art team for the Superman story in this issue. - THE MAN WHO BETRAYED SUPERMAN'S IDENTITY (13 pgs. ), was written by Leo Dorfman, and was reprinted in SHOWCASE PRESENTS: SUPERMAN vol. IV. - Supergirl starred in the 13 page story, THE FORBIDDEN WEAPONS OF KRYPTON, written by Leo Dorfman and drawn by Jim Mooney, and was reprinted in SHOWCASE PRESENTS: SUPERGIRL vol. II. Elsewhere in DC Comics, 30 titles carried the February, or February/March 1963 cover date, according to Mike's Amazing World Of DC Comics. Next Episode: SUPERMAN FAMILY COMIC BOOK COVER DATED APRIL 1960 PART I: SUPERMAN'S GIRL FRIEND LOIS LANE 16! In 2 Weeks: SUPERMAN FAMILY COMIC BOOK COVER DATED APRIL 1960 PART II: SUPERMAN'S PAL JIMMY OLSEN 44! In 3 Weeks: SUPERMAN COMIC BOOK COVER DATED MARCH 1963: ACTION COMICS 298!